This is a fine example of John's best work. In retrospect, President George W. Bush did some crazy things, but his critics were often even crazier. Northcott’s argument is compounded, in large part, of the ecclesiology of John Howard Yoder and Stanley Hauerwas, the eschatology of Rene Girard, the geopolitics of Andrew Bacevich, and the postmodern political prose poetry of Michael Hardt and Antonio Negri. Unfortunately, these people are not obviously in agreement about fundamental issues, and the author makes little effort to reconcile them. What holds the book together is a rambling, Soviet-surplus critique of the United States, updated by the propaganda of the antiglobalization movement. Some of this filler material is amazing. We learn, for instance, that 67% of the children of US veterans of the first Gulf War have some serious birth defect. We further learn that Islamism is, simultaneously, an artifact of American funding; an indigenous reaction to American-imposed post-colonial underdevelopment; and a modern, pseudo-Islamic ideology that mirrors America’s neoliberal globalism in being totalitarian and universalistic. The author even moves the great die-off of elderly people during the European heat wave of 2003 from France to Chicago. By the end of this book, American malefaction has become so ubiquitous as to be virtually unfalsifiable. This is a shame, since there are real issues here about the nature of American political culture and the interrelationship of eschatology, soteriology, and macrohistory. The author makes a remarkable hash of all of them. There are tensions in Northcott’s critique, to put it mildly. He posits, reasonably enough, that the philosophy of John Locke has strongly affected American political culture. The author then asserts that the Lockean understanding of government as essentially a device for protecting property is not orthodox theology, and is indeed postchristian, whatever the denominational affiliation of actual Lockeans may be. Well, maybe, but readers may find it hard to reconcile Northcott’s indictment of the sacralization of government with his antipathy to Locke’s political theory, which was designed precisely to keep government modest, both in its powers and in its ontological status. Be this as it may, the most important development in the history of American eschatology was the transition to premillennialism, which began about the middle of the 19th century. Premillennialism, sometimes called dispensationalism, holds that the Second Coming will occur before the millennium, preceded by disaster and apostasy. It does not see secular progress as a good thing, if progress is acknowledged at all. Its influence has spread steadily; today, it is perhaps the most widespread historical model among evangelical Christians in the United States (and elsewhere, one might add). It is associated, often if not invariably, with Biblical literalism, and with support for Zionism, which is held to be a fulfillment of prophecies of the Endtime. We are told that there is a synergy between dispensationalist fatalism and the ideology of the market, since both denigrate the possibility of collective action. This would be interesting, were it not for the fact that freemarketeers are optimists of the most annoying sort. Still, it is certainly easier to make that argument than to suggest, as Northcott also seems to do, that premillennialism is a religion of immiseration. In the US, the key figures associated with the revival of premillennialism were high-status churchmen and laity based in Manhattan. In the 19th century, this eschatology was not particularly popular in those regions that suffered social disruption in the course of industrialization. By the later 20th century, some form of premillennialism was becoming the mark of the rising classes of the Next Christendom outside the West. This only repeated its history in America, where evangelicals of all descriptions tend to be richer and better educated than the population as a whole. Neither will it do to make premillennialism a religion of capitalism, either international or domestic. Contrary to what Northcott believes, Americans by the later 19th century were not satisfied with their “national Bank” and its capitalist ways. America did not have a central bank from 1836 to 1913 because the people in the states that later became highly evangelical were suspicious of large institutions. In fact, they also made sure that private banks could not operate nationally until relatively recently. High tariffs, restricted immigration, and suspicion of finance are the evangelical political tradition. The current association of evangelicalism with big business in the Republican Party is a historical accident, occasioned chiefly by the decision of the Democratic Party to walk the plank on the abortion issue. Northcott asserts that Bush’s policy “is consistent” with the abandonment of the attempt to build the postmillennial Zion in America (of which the Puritan Fathers dreamed, however mistakenly), in favor of a premillennial project to aid the construction of a Jewish Zion in Israel. This is an interpretation against the text, since the fact is that the Bush Administration does claim to be acting in the name of reason. Certainly that is how the Administration talks about geopolitics. That is even how the Administration talks about Israel. 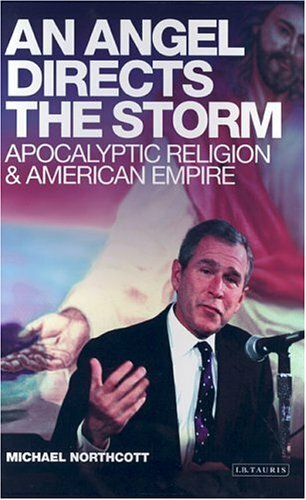 Only when we dismiss the canard that George Bush is trying to trigger the Battle of Armageddon do we come to the really interesting point: under Northcott’s analysis, Christians would have to oppose any forcible attempt to maintain world order, or indeed national order. To this, one may say that anyone who thinks that the word “Antichrist” appears in the Book of Revelation could have his license to practice eschatology revoked. In any case, we need to remember that if Revelation really were just an anti-Roman tract, it would not be very interesting, and we would not be reading it today. Anti-Roman sentiment is, of course, present in that book: the Whore of Babylon is Rome. However, she is killed at the behest of the Beast. The message is that, bad as Rome is, it’s really just a front for something much worse: of the archons, of whom St. Paul wrote, who really rule the world, and against whom it is the real business of Christians to struggle. To be fair, we should note that the author acknowledges that Jesus did not preach political resistance, even of the passive Gandhian variety. We are also told, eventually, that Paul commanded obedience to the state, but then we are also told that Paul meant that the powers of the state were legitimate only when they were used for right purposes. At the risk of getting into a proof-texting contest, I find this hard to square with the remark of Jesus to Pilate that Pilate’s power was “from above,” even when Pilate was about to have Jesus executed. Theocracy is a poor notion, but it should not be confused with the immemorial Christian principle that the state is a part of a providential order, and not simply a feature of a fallen world. Northcott’s pacifism rejects pietism. Pietism, he says, comes from the error of putting the soul in the care of religion, while leaving the body to the control of the state. That error, in turn, comes from viewing the Church as one association among many, rather than as a comprehensive community. The politics of the Christian community is “the non-coercive quest for peace and justice in a sinful world.” Christian community does not require self-segregation: far from it. Christians should pray for the welfare of the city into which they have been sent, and work for its welfare, as Jeremiah advised the exiles from Judea. They must never take charge, but hold those to account who try to take charge, particularly if they try to take charge in God’s name. On the global level, Christians are to reject the temptation to control history’s outcome, which was among the things that the devil unsuccessfully tempted Jesus to do. The fate of the modern international system is important, because the international system is a very big thing. The atmosphere is a very big thing, too, but we usually don’t accuse people who study or to try to influence it (by controlling industrial emissions, say) of usurping a divine prerogative. The historical world is different from the atmosphere, of course, particularly in that the historical world consists of human groups in conflict. Northcott says that God does not choose sides between these groups. To that, the short answer may be to stop telling God what to do.